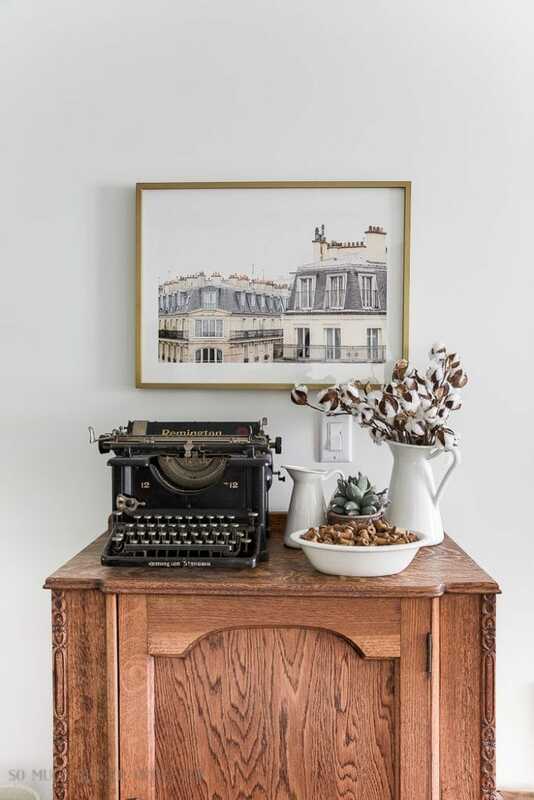 Have you wanted to create a French Vintage look in your home but don’t know where to start? 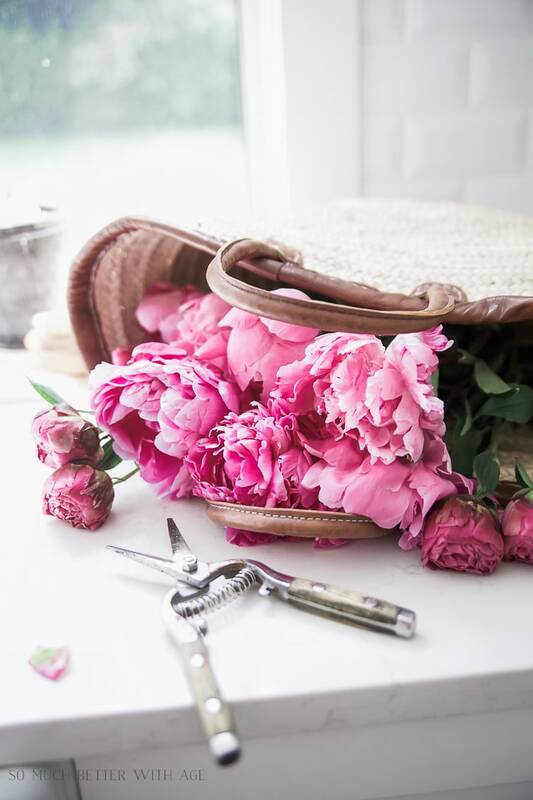 This post contains 8 tips on how to create the French Vintage look yourself! Jamie from So Much Better With Age does it perfectly, and I’m thrilled to have her here today to share with you. 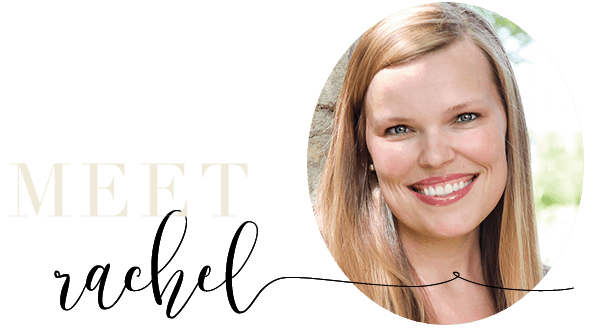 I’m so excited to be posting on Rachel’s blog today! Rachel and I have been blogging friends for a number of years now and we get to see each other every year at the Haven Conference in Atlanta. I simply adore her and her style and I think my similar style might be something you lovely readers will like. 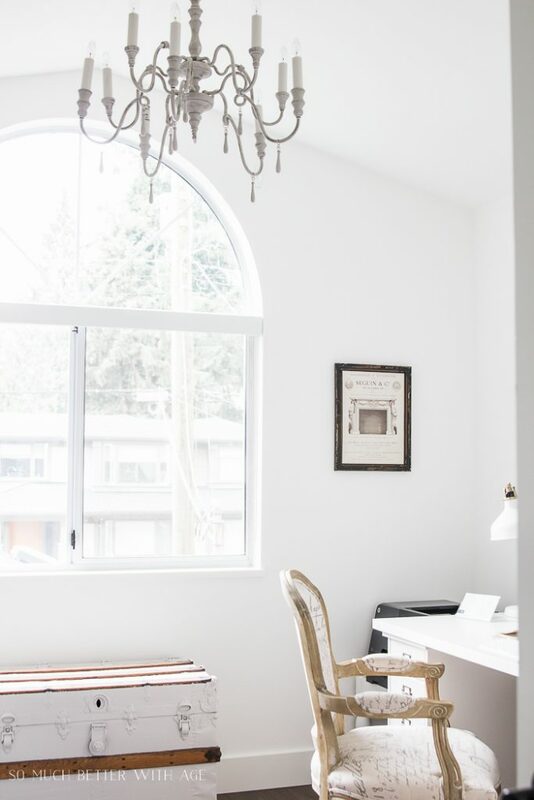 I live in Vancouver, BC Canada and have been blogging for over five years now. I love all things French and I’m pretty sure that’s how Rachel and I first connected – over our love of France! 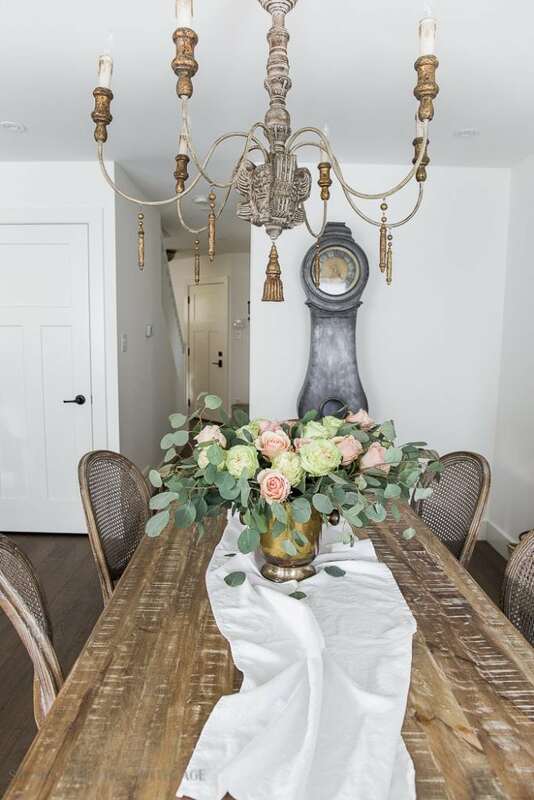 I try to incorporate elements in every room that give it a bit of a French flair but it’s definitely not overdone. I love mixing new and old and I’m currently living in an 80s house that was been renovated with modern elements but I added French Vintage decor so I definitely know you don’t need a villa in France to recreate this look (although wouldn’t that be amazing?!). I have a chandelier in almost every room of my house but this one in my dining room is by far the largest of them (and my favourite!). 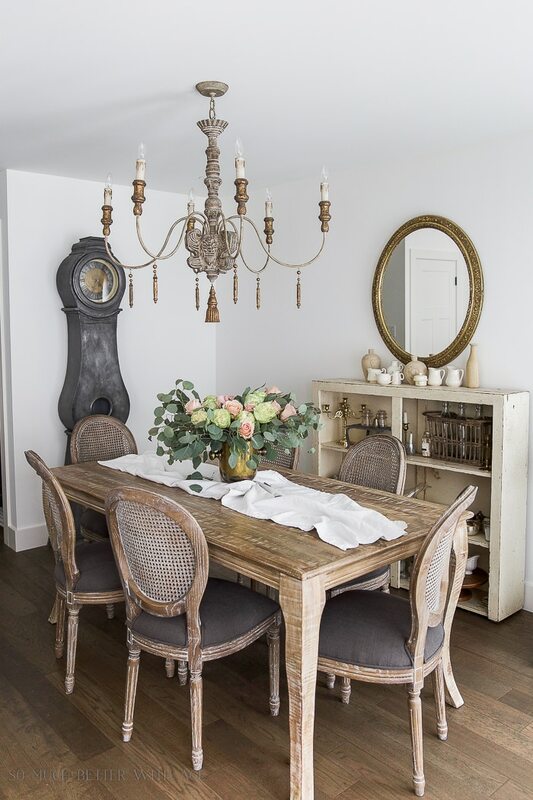 Having a chandelier can make the biggest impact in a room to create a French Vintage look. Even my office has a chandelier. Every piece of furniture doesn’t need to be curved but a couple of curvy accents chairs throughout your house will do the trick. 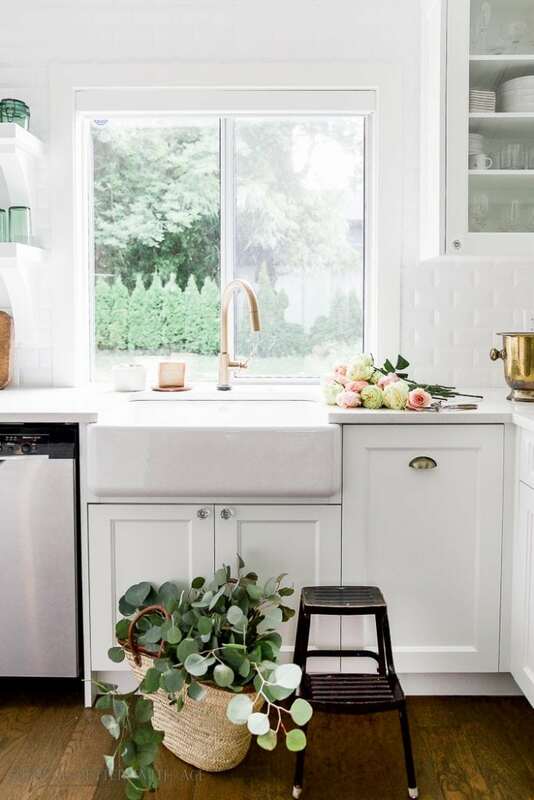 Gold is so French and I’m so glad it’s made a comeback with home decor. I don’t need everything to be gold though. This gold mirror (in my powder room) mixed in with a modern light fixture and modern faucet looks great together and makes the mirror really pop. Even brushed gold looks amazing like the faucet and handles in my renovated kitchen. French Vintage wouldn’t be the same without the ‘vintage’. 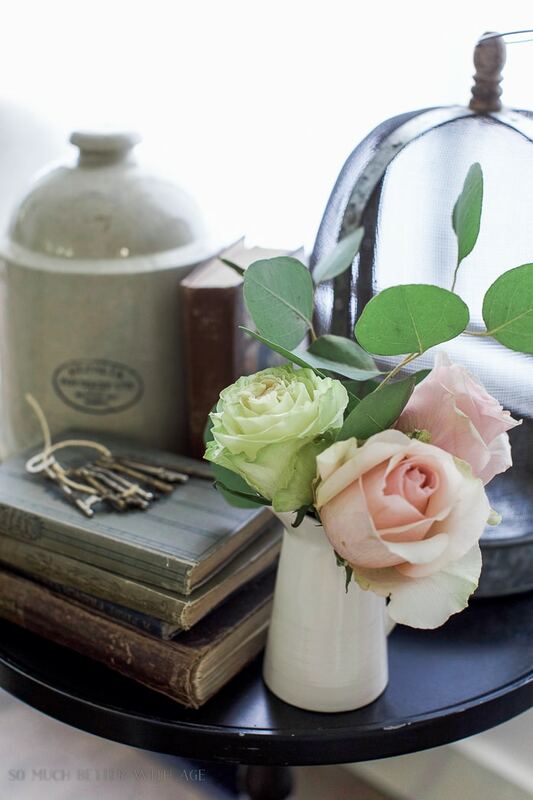 I’m always finding unusual objects that are old to display like using this old champagne bucket as a vase. Old books and a set of keys is another way to bring in some old. 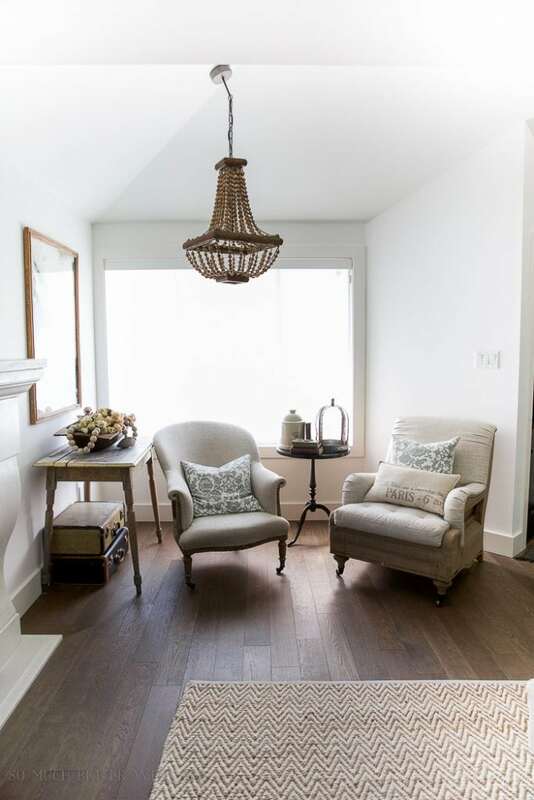 I love white walls with natural woods neutral furniture. Some color is nice to throw in but I usually keep it subtle and pastel. 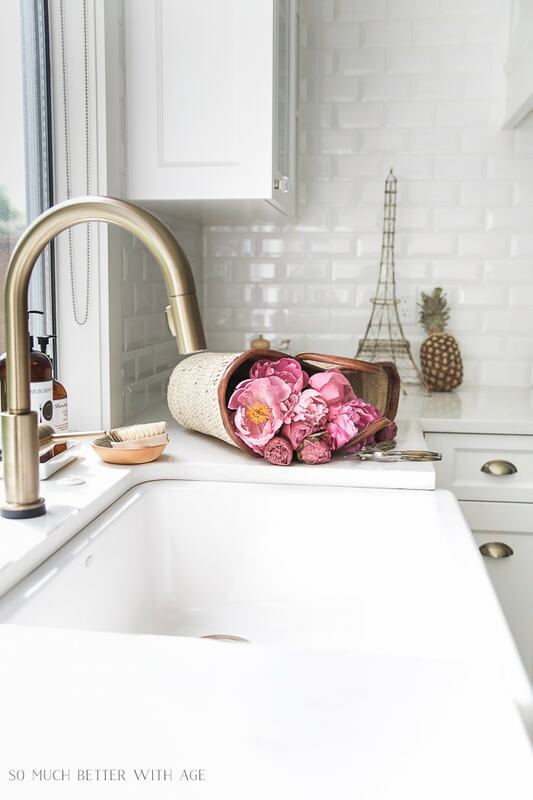 I love baskets and French market baskets are the perfect way to add that French Vintage flair to your kitchen. Flowers are a must. Any room just comes alive with even a small bouquet of flowers. 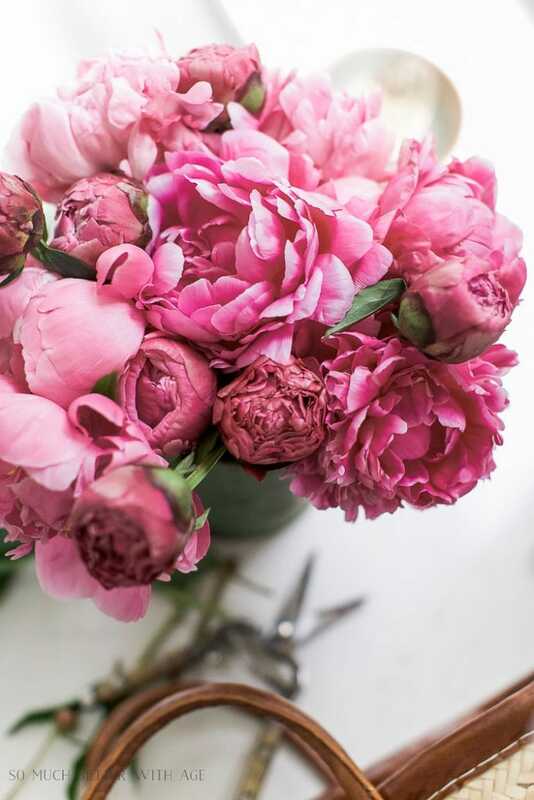 Grab your own flower bunches from the grocery store and arrange them yourself to save money. I love this antique linen runner I picked up in France last year. I love linen clothing and even if it isn’t actually linen, I love a linen look. 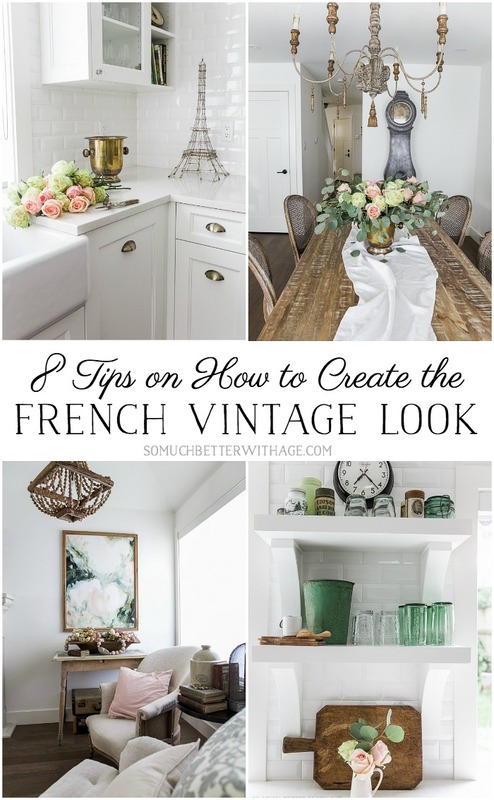 I hope you found these 8 tips on how to create a French Vintage look helpful! 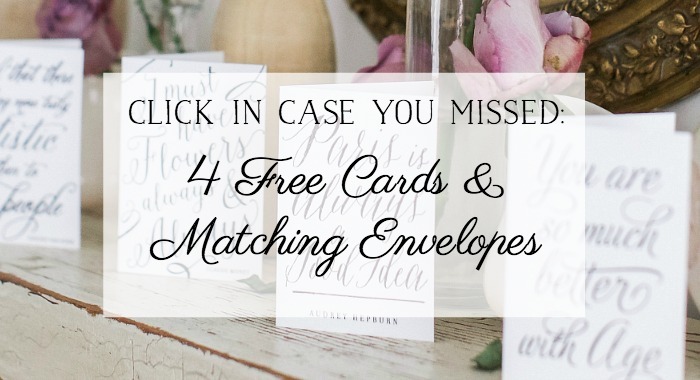 I’d love for you to pop by my blog to say hi and be sure to grab these free printable cards with matching envelopes for you to download at home. 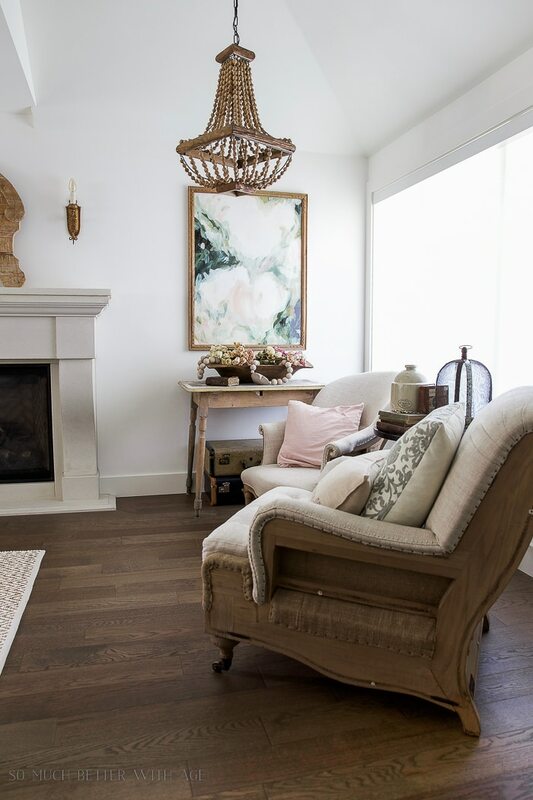 Your style and your home are just stunning Jamie! Every single detail! Love it all! Her attention to detail is amazing, isn’t it?! Great tips, Jamie! 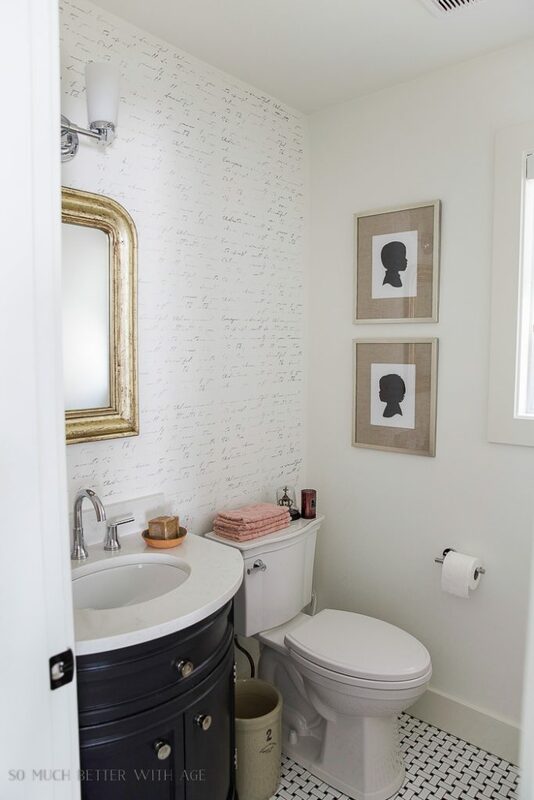 I love your style and all your french vintage touches are just perfect! It was such an honor to have you, girl! Thanks for your hard work on such a lovely post. Love all of this inspiration! Definitely helpful to break down different aspects of the style… my wheels are turning! Such beauty, right?! So glad you enjoyed it, Sara! Jamie your home is always so amazing and inspiring! Great post! Right, Deb?! Jamie is so talented. Great tips, Jamie! I love your home and especially love the chandie in your dining space! Your home is an absolutely knock out, Jamie! You can tell every detail has a story and is full of character. I’m so happy you shared it with us! I’m so happy to finally see this beautiful home… my computer won’t allow me to go to her blog… says it isn’t a secure connection. I don’t know if the problem is on my end or hers…. My site is secure with HTTPS which means you won’t be able to view my blog from some browsers so you might have to try from another browser (i.e. Chrome, Safari etc). I’ve also just put in a question to my tech lady to see if there’s anything that she can do on her end. I hope you come back for a visit! Everything is so beautiful! Great tips for having French style in your home! Right, Suzy?! Jamie is brilliant!! I always love everything you do Jamie! Thanks for sharing your beautiful tips!! Hi Jamie & Rachel! OK…I adore everything but the kitchen blows me away. So pretty! Amazing tips, and beautiful images! Thanks for sharing! Jamie, I always love seeing pics of your beautiful home. 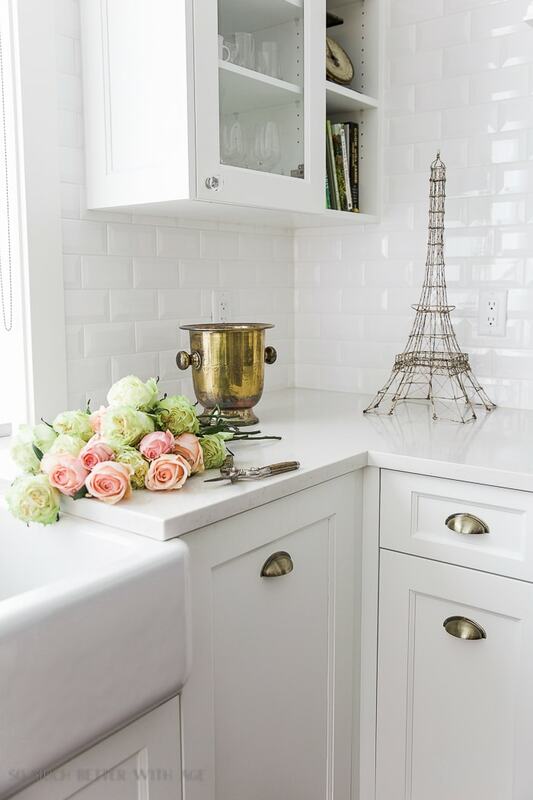 You have a gift of adding french touches without going over the top. Beautiful! Love your style, Jamie. 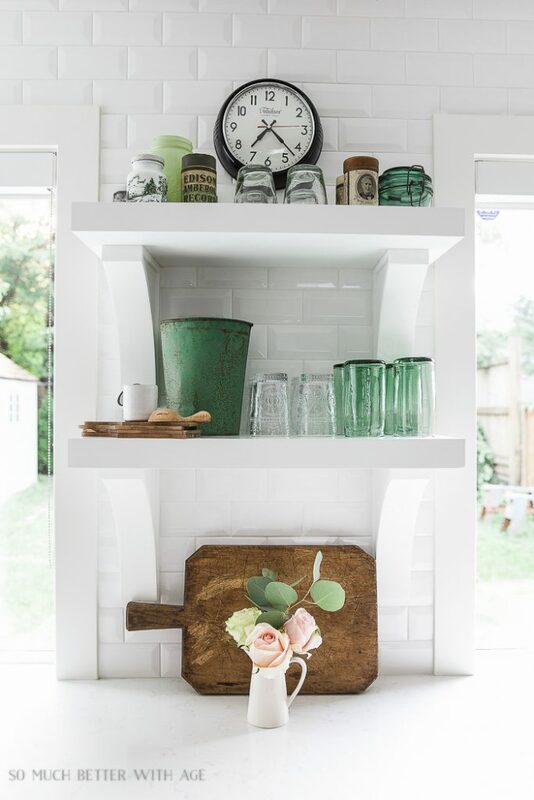 Have been hunting for a clock like the one in your dining room. Any hints? 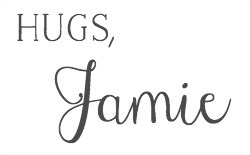 This was from my friend Jamie of So Much Better With Age as a guest post! I’m sure if you visit her site, she’d be happy to tell you where they found the clock.